Introduced in the series’ third season, the young engineer was made the head of the Foot Clan’s Science Division following the numerous failures and subsequent demotion of his predecessor and idol Baxter Stockman, much to Stockman’s chagrin. Much of Chaplin’s work is based on that of Stockman, but much perfected. Upon his introduction, Chaplin was in charge of retrievingTriceraton technology to use for the Foot and after designing more effective robotic drones than the ones Stockman had created, in appearance based on Karai (to who he had a crush on.Chaplin was promoted to Stockman’s old position as the chief of the Foot’s Science division by the Utrom Shredderdespite that they were unable to defeat the Turtles. Chaplin was also the captain of the Utrom Shredder’s space vessel as it departed Earth’s atmosphere to the Utrom homeworld. He expressed his enthusiasm for the job, not even bothered by Shredder’s true Utrom identity. He continued to place faith in Dr. Stockman, who designed the ship’s defenses, however, Stockman had betrayed them and sided with Agent Bishop, and shut down the defenses. He would be sent back toEarth with Karai by the Utroms. In the Ninja Tribunal story arc, Dr. Chaplin was still the head scientist of the Foot under Karai. He first appeared in an attempt to help Karai fight off the resurrected Tengu Shredder, who had come to destroy her. His subsequent appearances saw him helping the Turtles, Bishop, Karai, and their other allies in their campaign to defeat the Tengu. In this campaign, Chaplin became prominent for designing special Mystic Tech weapons, magic-powered weapons, which were mainly made up of blasters, with a sword version made for Karai’s use to fight the forces of the Tengu Shredder after Karai learned of the threat against her after the Foot Mystics betrayal. Upon The Shredder and the Foot Mystic defeat at the hands of the Turtles, Chaplin is last seen talking with Karai, who admitted that she wished to only think about the immediate future and walked from the battlefield holding Chaplin’s hand, finally returning his affections for her. 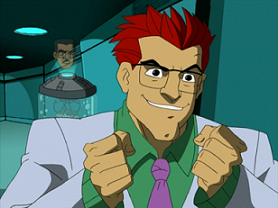 Dr. Chaplin appeared in Wedding Bells and Bytes as a guest at Casey and April’s wedding, and subsequently aided the Turtles and the other guests when the Cyber Shredder and the Foot Clan attempted to crash the wedding.